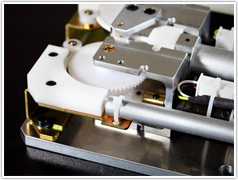 Telcon is a single source provider of individual components and top level assemblies. By combining dedicated and professional staff with leading business, engineering and manufacturing systems, we are able to provide a superior level of service and flexibility. We offer corporate stability with continued reinvestment in our business and an established aggressive philosophy of continuous improvement. Our in-house capabilities and experience combined with an established network of efficient suppliers can cost-effectively take your project from drawings to finished product. Our process driven lean operation combined with our advanced inventory planning and logistics capabilities can help to drive down your costs and simplify your supply chain. Telcon supports various levels of supplier integration. LEVEL 1 - Precision machined components and weldments. Custom lead castings. LEVEL 2 - Conventional mechanical assembly and/or parts kitting and packaging. LEVEL 3 - Electro-mechanical assembly. Installation of cables and cable harnesses, connectors, fans and other various electrical components. Test and configure. ESD prevention implemented when required. LEVEL 4 - Turnkey Virtual Business Unit. Total project management, including supply chain management, manufacture, test, device history record keeping and serialization, custom configuration, custom labeling and packaging. Facilitation of your customer's demands through direct shipping or delivery to your dock. Telcon has the ability to provide total product lifecycle management at any level of integration beginning with early supplier involvement during the design phase. We will take your project from prototype to production. We provide management of component service parts and field replaceable units. Field replacement components are often sent directly to repair site locations or directly to your customer. As required, we maintain lot number control and serialization of individual components or assemblies, as well as the completion and retention of Device History Records as defined by the FDA, or other required quality assurance data.